There are some adventures that are so rare, uncommon and unique that you just have to do them. And when it also covers an interest you have for adventure or learning, so much the better. 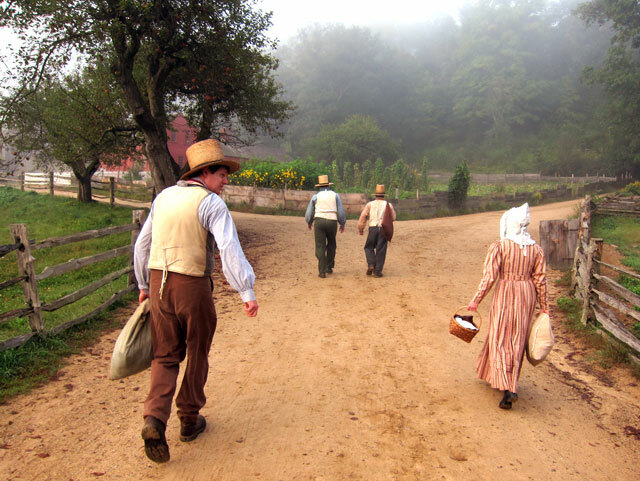 And, that is what I did – I signed up for BOARDING WITH THE BIXBYS at Old Sturbridge Village – OSV. 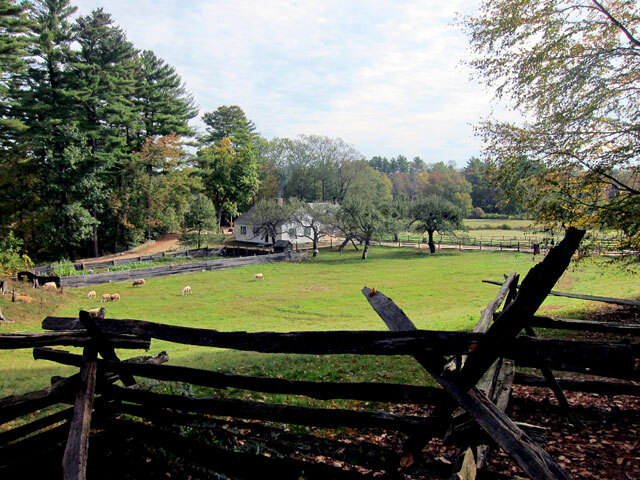 You may recall that last year I got back for the first time in about nine years for a full day at Old Sturbridge Village in Sturbridge, Massachusetts, and also attended the SLEEPY HOLLOW EXPERIENCE. You know I “vote with my dollars” and became a member during that visit. 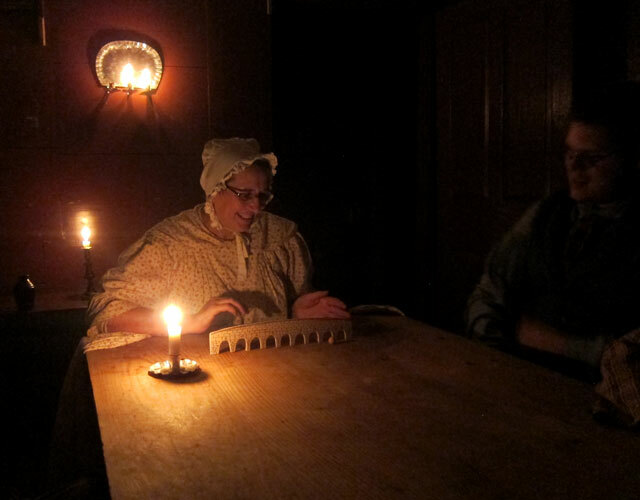 I returned in December for CHRISTMAS BY CANDLELIGHT in the Village. Do visit both of my links above. I tried to go to this experience in the Spring, but the session I choose was cancelled. The program is designed for six participants, and as I learned, three are needed. Laura, her daughter, coming from State College, Pennsylvania, and I were the only three signed up – and thanked each other for doing so. 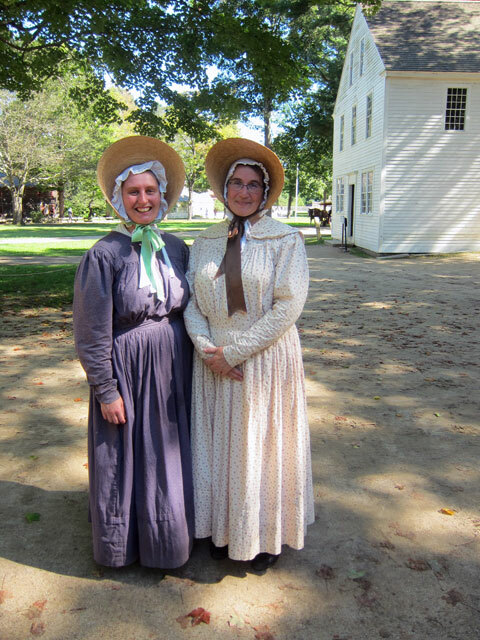 Meeting at the visitor center, our interpreters, Ruth and Susan, met us and took us to costuming to be outfitted for 1838. 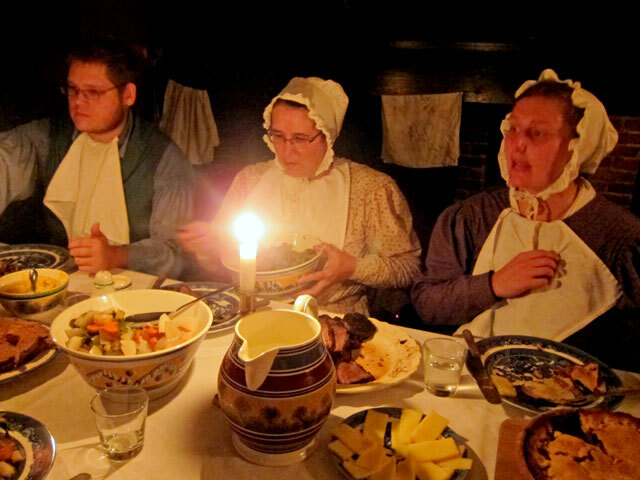 OSV, as a living history museum, unlike others, focuses on one time period – 1838. A fantastic approach, and made even more special by the interpreters on the grounds. This is a working town and surrounding farm side, and mill area. In my previous visits I realized everyone was a family, and that only happens when management does its job in treating people well, training, and just comradeship. Following costuming we headed to our home for the next 22 hours – the Bixby House. 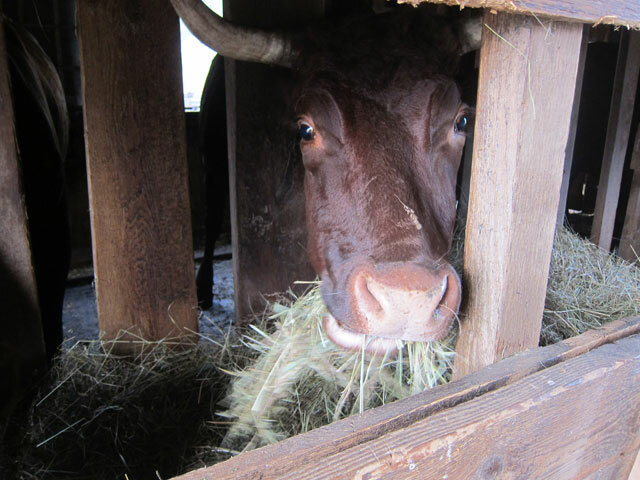 We received a brief introduction to the house, made our beds (which have straw and down mattresses). I really did not understand the fact that the afternoon would be spent with a craft. I choose the Tin Shop, and expected to just observe as the tinsmiths worked and chatted with visitors. Was I wrong, I was put to work making sconces. 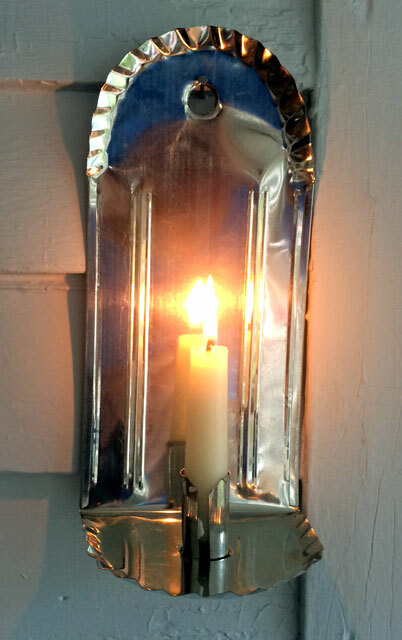 And, then I was overwhelmed to learned that the two sconces I made I was getting to keep (see images at end). Ray in costume, ready to work in the Tin Shop behind. Here is the interior of the Tin Shop – taken the next day (remember, no cameras in 1838, so when the museum was open, as participants no photography). Phil has been with OSV almost 40 years. In conversations I learned many people have “worked” here for decades. 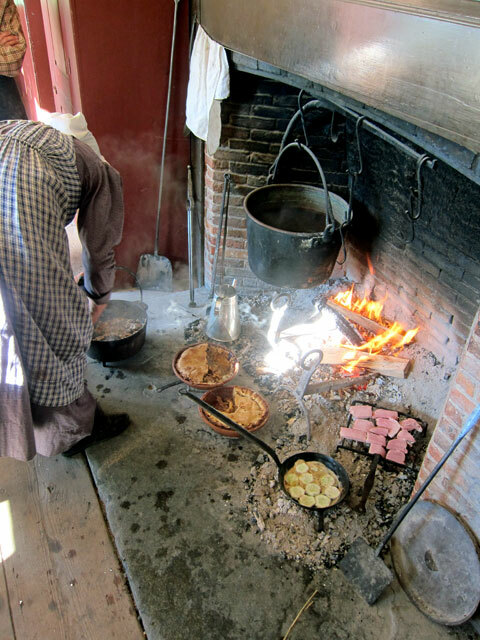 Completing my two hour apprenticeship at 4, it was time to head home to prepare dinner – a four hour hearth-side process. 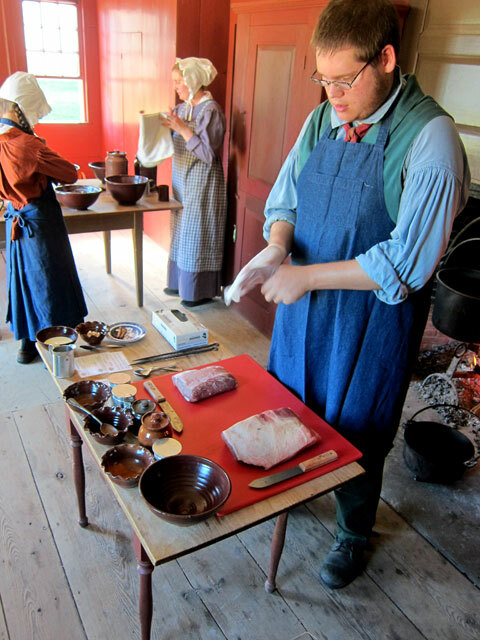 Zack joined us, and began preparing the meat. I prepared the rub, and coated the roast. 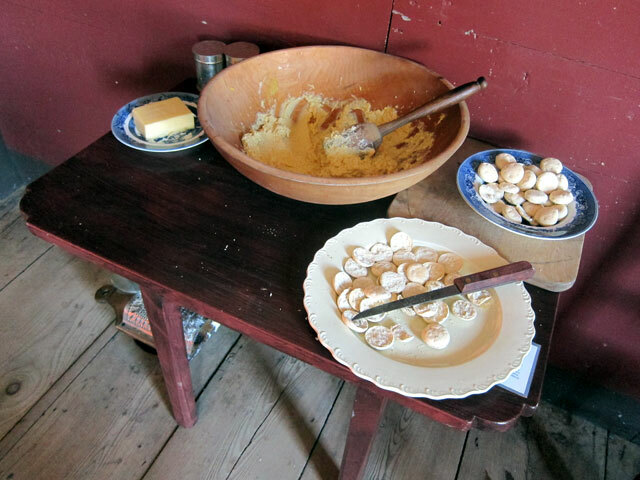 As an appetizer, Laura prepared Pounded Cheese with Common Crackers. She grated two cheeses, and then rubbed together with butter using a mortar. Sherry was added for that extra touch (I have all the recipes for the event, just email and ask). Pounded Cheese – ready to eat – well, after some work. 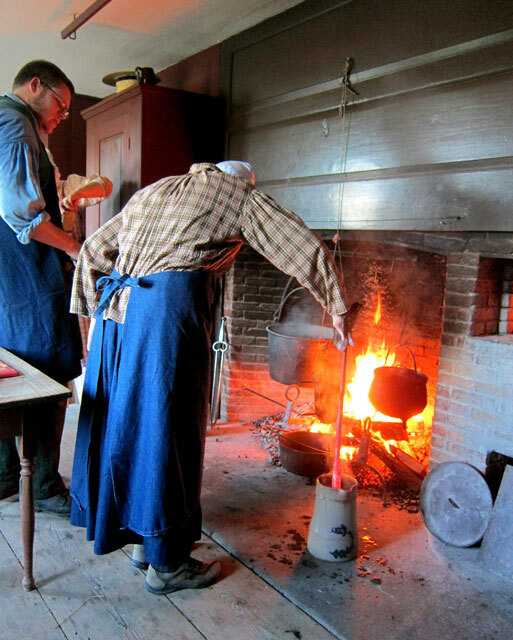 Ruth got the oven going to bring up the temperature for baking the bread and pies (not desert pies – part of the meal itself). I was put to work (after finishing the rub) to coining vegetables. One new thing/term I learned. Zack got the roast going. Skewers through two ends, string attached, and we constantly made sure it was spinning for even cooking. Often then the meat would be shifted to the other skewer. Mulled cider? Of course, and once the spices were dropped in, a hot poker was inserted to boil and caramelize them. 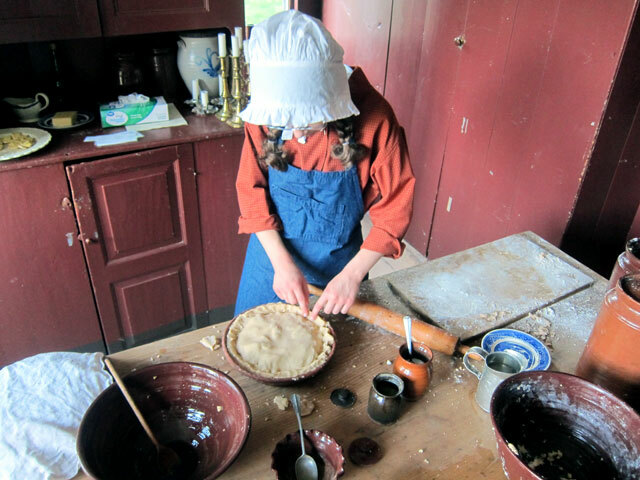 Laura’s lovely 13 year old daughter did a fabulous job making the bread and dressing the pies. 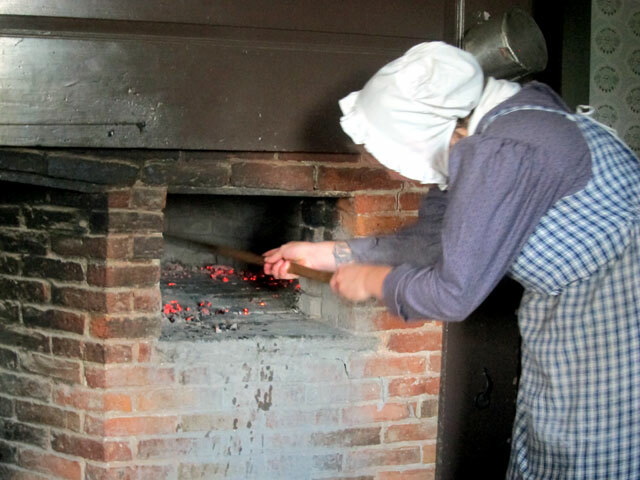 With the fire in the oven bringing the bricks up to temperature, Ruth scraped out the coals. Then, with her experience, she checked to see if the temperature was correct. It was, she could only hold her hand in the oven for 12 seconds. 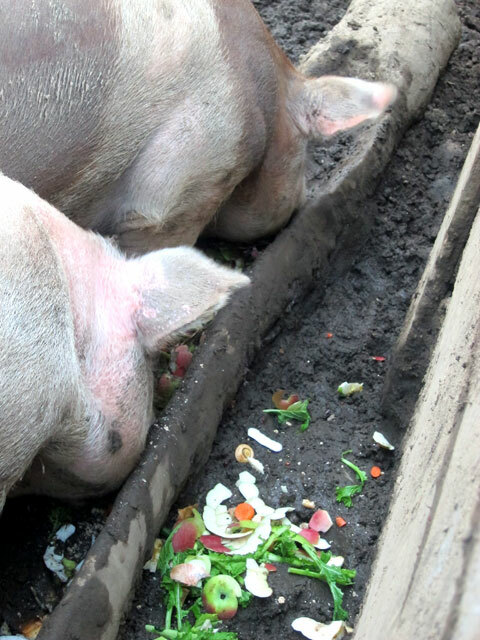 while things were cooking, we went up to the Freeman Farm to feed the chickens, and the scraps to the pigs. Every question I asked, I got great detailed answers. I asked Zack why the pigs are always in mud. Hopefully I am relating this correctly – pigs do not have great skin/hair systems to prevent heat loss, or protection from the sun. They roll in the mud to keep cool, and coat themselves to minimize exposure to the sun and heat loss. And, now you know too, and they will eat anything at anytime. Just part of the process for Christmas dinner. Our hosts, Zack, Susan and Ruth. Note serviettes tucked into neckline – what was done. Not napkins as a term — those were on babies’ bottoms. And, as was appropriate, I am now adept with eating with a knife – the wider the better, and actually very easy. Small fork is a pusher. Sometimes (as is my good fortune) timing is everything. 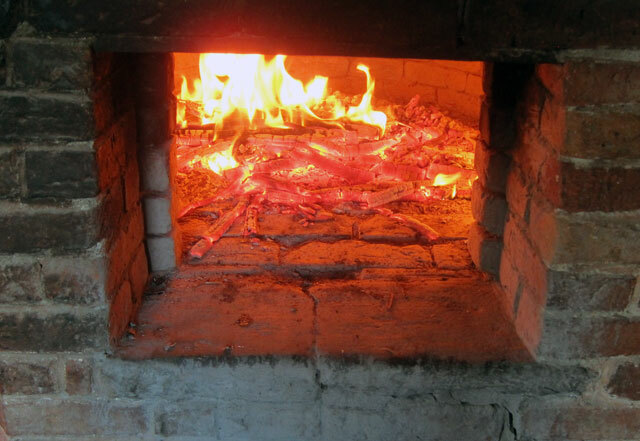 Once a year the potter’s kiln at OSV is fired, and this was the night. A three day process to fire several thousand pieces – and we were there at the right night. 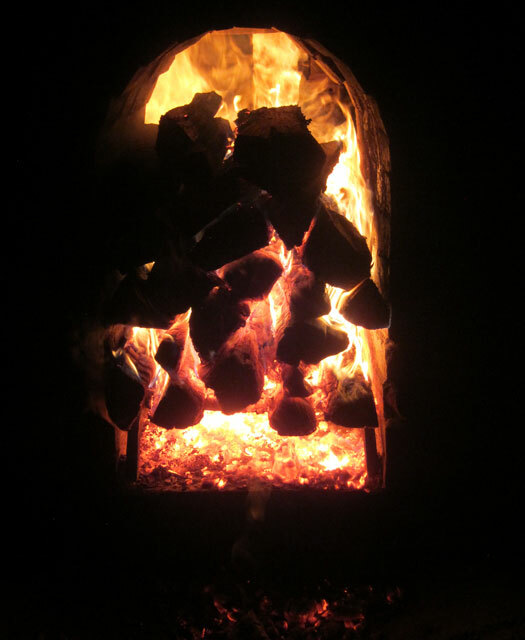 The fire burns at two opposing sides – not the inside of the kiln. The intent is to bring the kiln to 1800 degrees if I remember correctly. 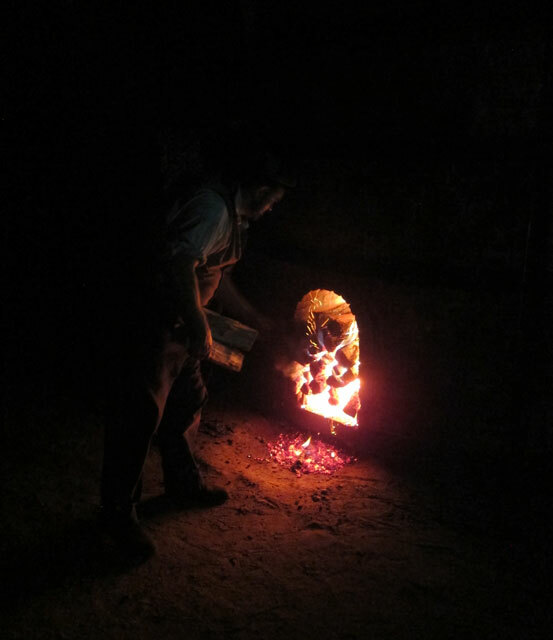 The coals are cleaned out below the burning wood so the draft of air carries the heat up into the kiln. 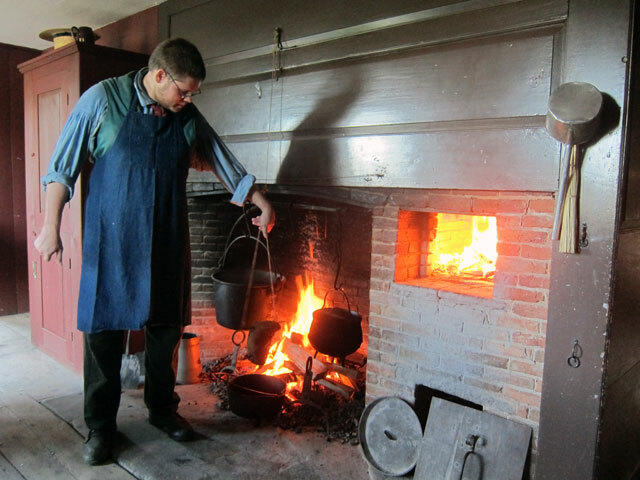 It takes a day to get up to temperature, a day to fire the items, and a day to cool down. Four cords of wood are consumed. 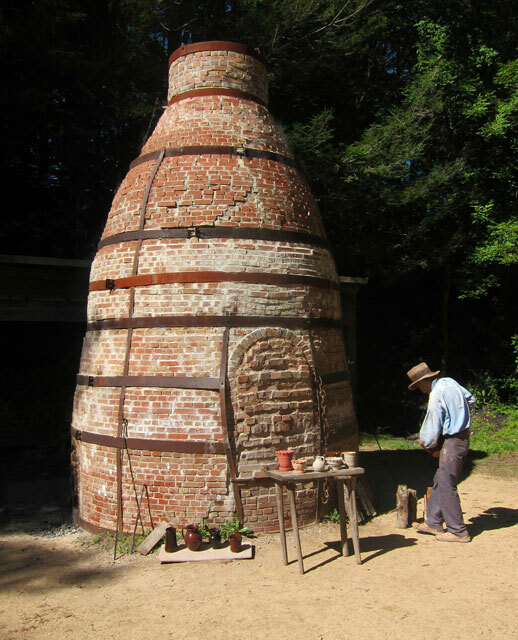 Here is an image of the kiln I took the next day – after the program when I could use my camera in public. When we returned from experiencing the firing of the kiln we played several games. Here we rolled (not so round) clay marbles (or tried to roll) through holes with different scores. Not sure anyone won. At about ten our hosts departed for the night until returning at 7AM. I was exhausted, and retreated to my room. The newest room in the house built as the families’ finances increased. 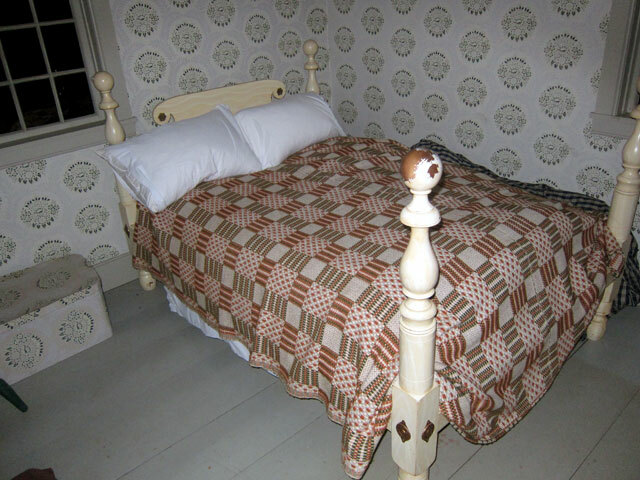 Mr. and Mrs. Bixby slept here, their three daughters in the new chamber above built off the garret. 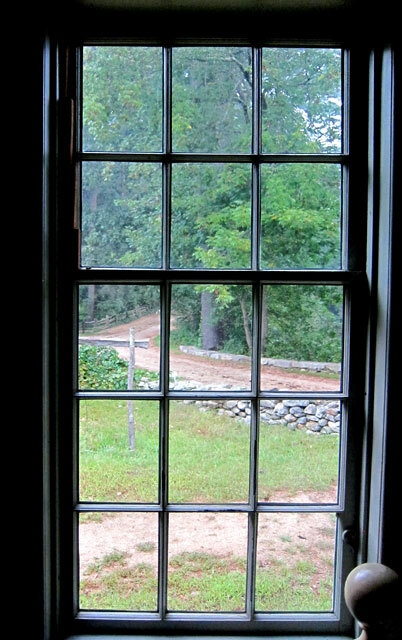 morning came quickly – the view out my window. 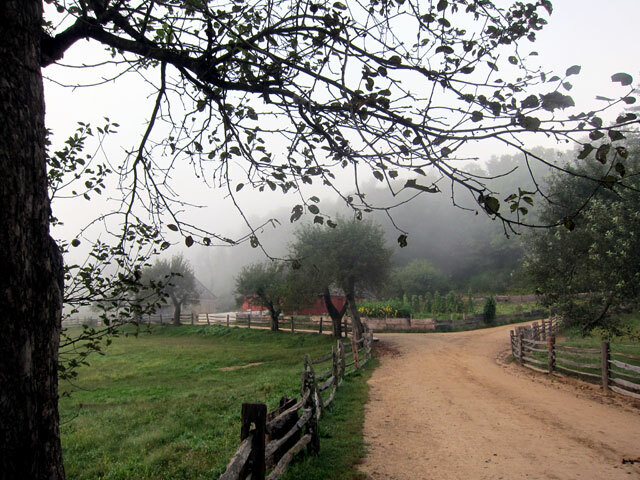 and, around the Bixby House in the fog. 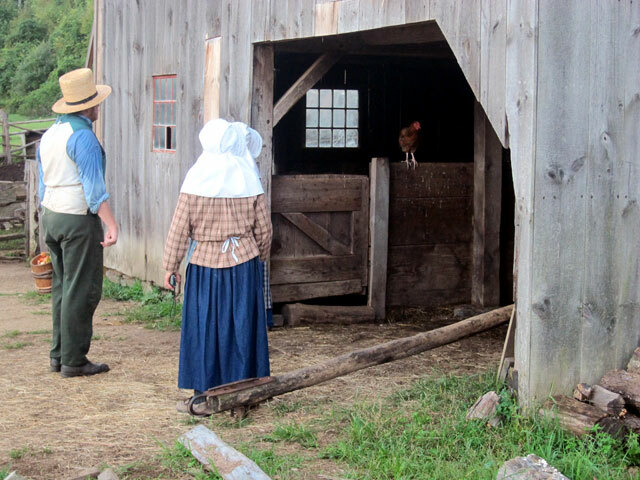 And then it was into town to feed chickens, turkeys (Thanksgiving is coming – don’t tell them), and the sheep. 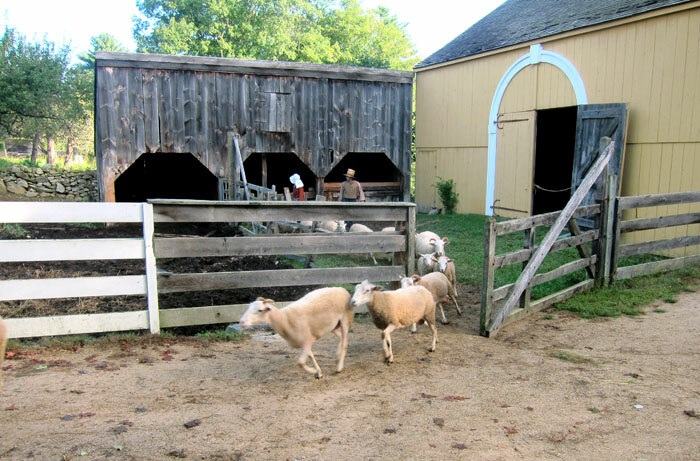 The sheep stay at the Towne House residence at night, and at the other end of the common (next to the Meeting House) during the day. Twice a day a gate is opened, and off they go for their next feeding. Before it even started, it was over about 10AM Sunday. 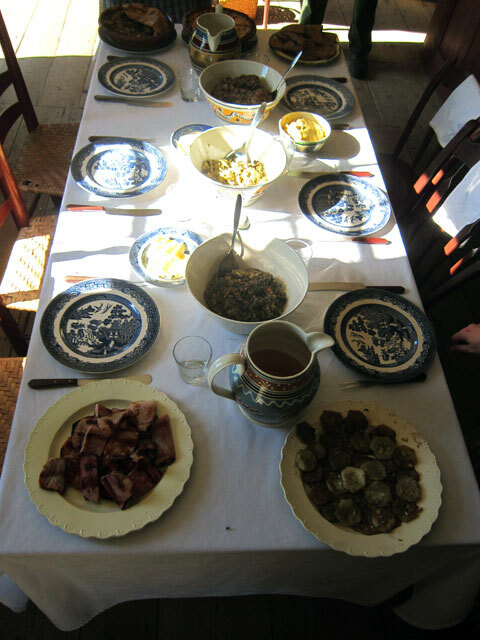 TOO MUCH FUN, and worth every moment, and every penny – lodging, two meals, two sconces, and then a gift of blacksmith made skewers just like we used. 3- Read and devour OLD STURBRIDGE VILLAGE by Kent McCallum – get at your library, inter-library loan, or on-line (around $10 with luck). I love my copy, read several times. The Bixby House and blacksmith shop are on the front cover. 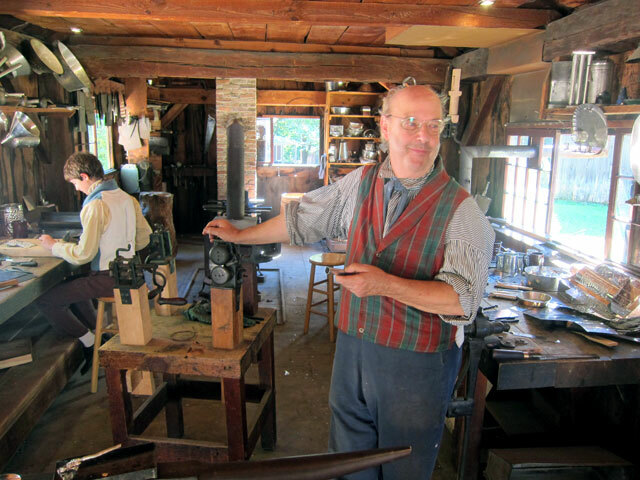 I couldn’t leave, and enjoyed OSV until about 2:30 sitting on benches, talking with interpreters, and visiting the Tin Shop, Print Shop, Country Store, and more. Realizing I had not gotten a picture of Susan and Ruth, fortunately I saw them coming down the path. Here they are with the country store from Dumerston, Vermont (across the river from me) in the background. Then I saw George. We chatted a great deal in October finding many mutual acquaintances. 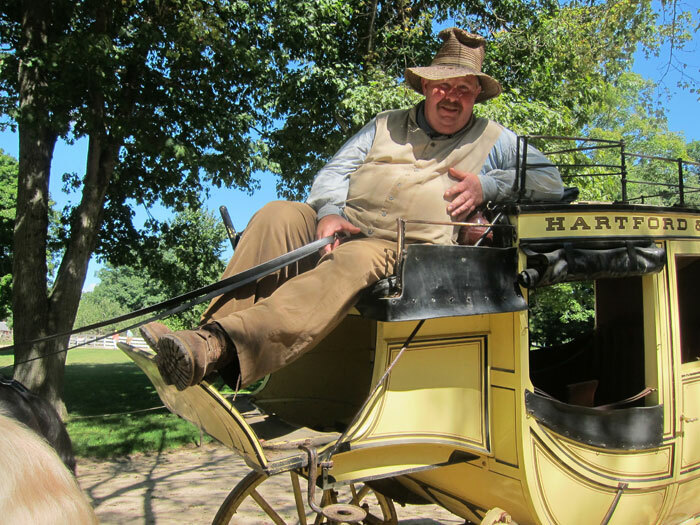 He provides the teams for the buggy and stage rides. 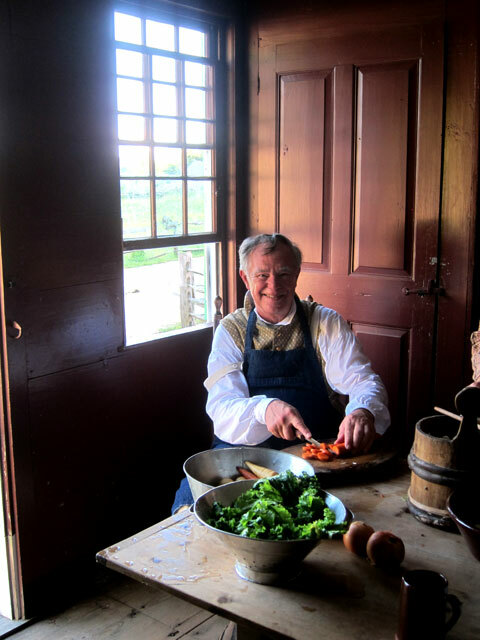 Everyone at OSV is a treasure and asset to the experience. 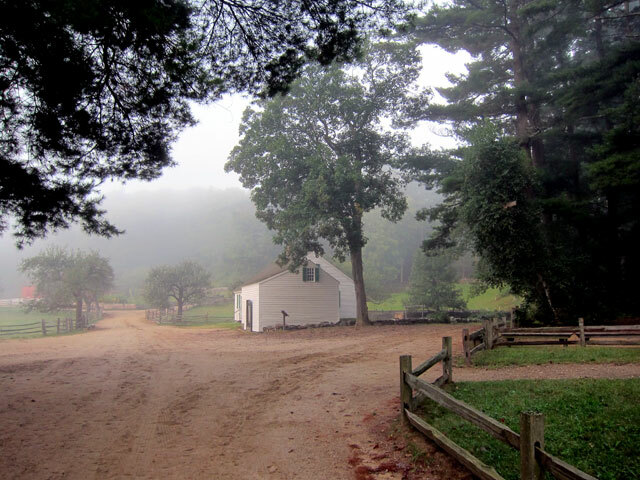 I travelled to Sturbridge on back roads (of course) – Route 32, Route 32A, Route 9, Route 148 to US 20 into Sturbridge. 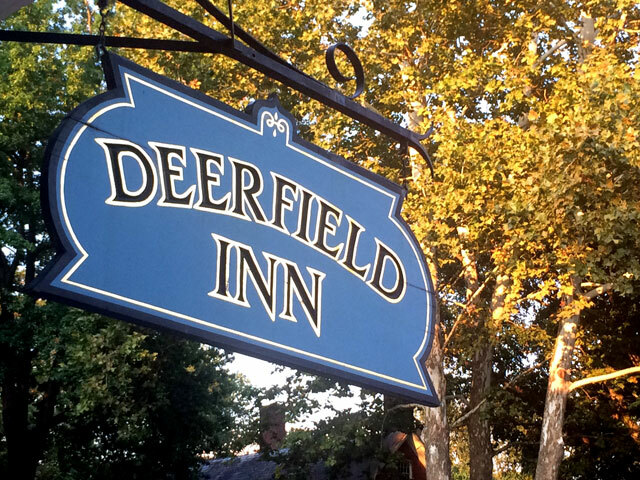 And, did the same on the way home working my way up to Old Deerfield — of course. And it was time for dinner before I went home, and back to work. Not having eaten at the Inn since July, I ate on the porch. 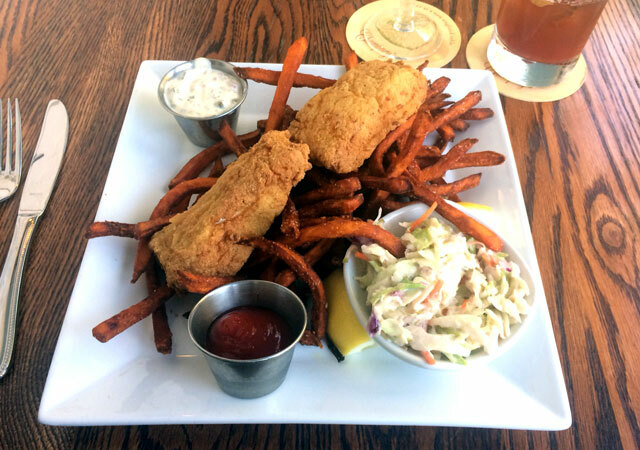 And, my fish and chips was amazing. 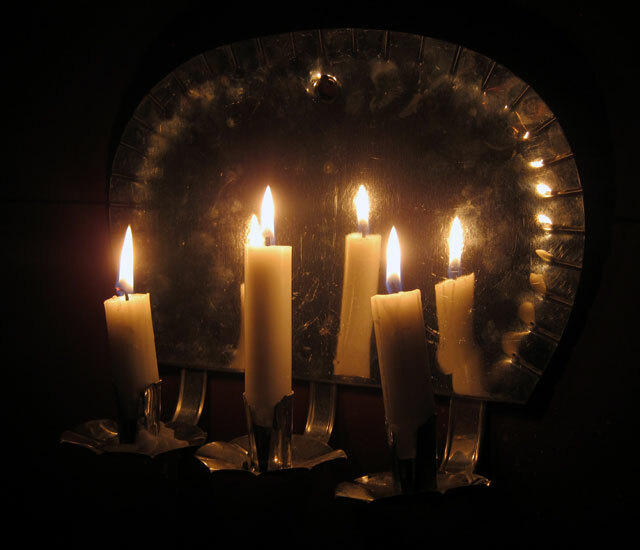 Remember my post – FLICKERING HOMES OF A HOPELESS ROMANTIC? 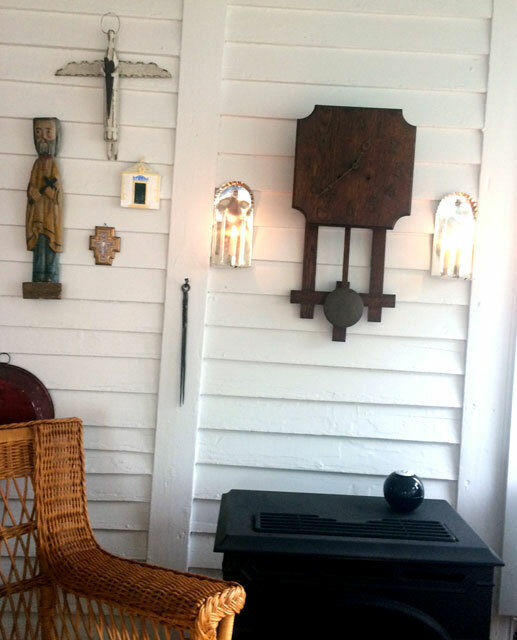 Well, now I have two more candles on my porch – my own handmade tin sconces that I made at the OSV Tin Shop. 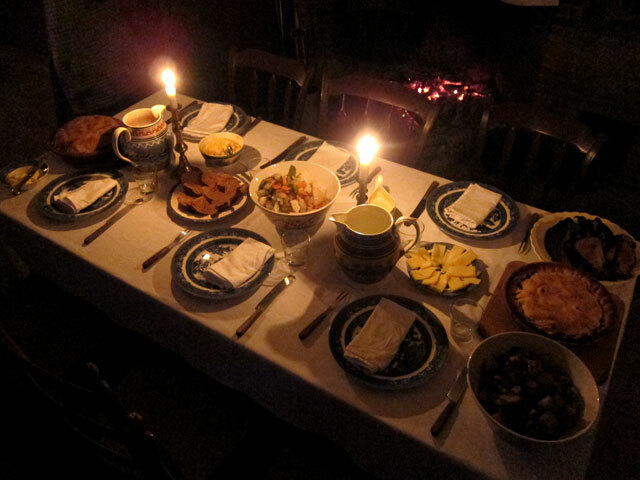 Not a good image below – better in flickering light – on the board in the center is my gift of two blacksmith made skewers. 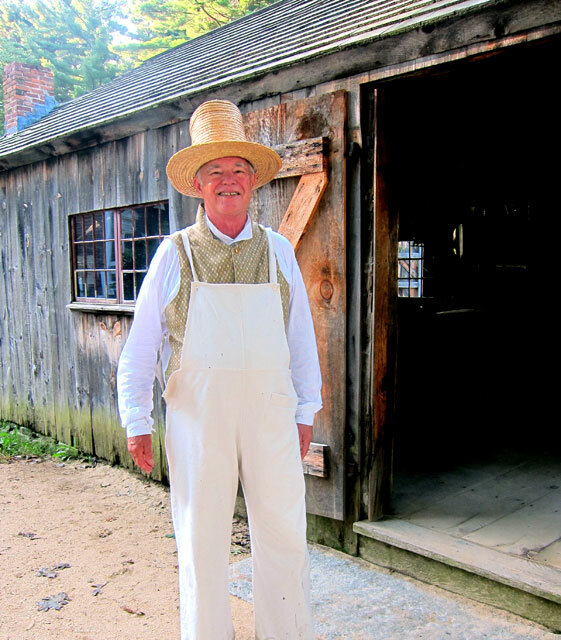 Did I say – RAY RECOMMENDS – Hurry to Old Sturbridge Village, now and often. This entry was posted in Day (or maybe two) Trips and tagged 1838, Boarding with the Bixbys, Massachusetts, Old Sturbridge Village, Sturbridge. Bookmark the permalink. Ray, I always enjoy reading about your adventures. 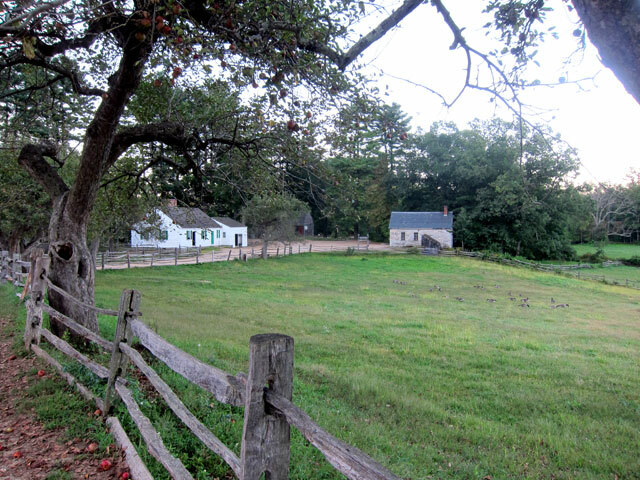 This one at Old Sturbridge Village sounds exciting and almost surreal to step back and live in 1838. I am glad I was born in a later century! Fascinating, a great adventure. Very brave of you.